From portable scopes to a wide array of testing tools, oscilloscope design keeps up with the times. A key piece of electronic test equipment for well over half a century, oscilloscopes have long given engineers and designers insight into the invisible world of electrical signals. And as those signals got faster and decidedly more complex, oscilloscopes evolved. Multi-instrument capabilities are common in today’s oscilloscopes. The MDO4000C series of oscilloscopes from Tektronix can be configured with up to six instruments in a single unit, including a full spectrum analyzer. And they’ve kept on evolving, rising to the challenges of contemporary design. Some of those challenges include the pace of design itself. No longer is it good enough to have and use one instrument for decades. There are many reasons for this, including that signal speeds are orders of magnitude faster than signals of yore. As well, there are far more mixed-signal designs, so engineers need more channels on scopes and more capabilities. New applications are also driving scope design. For instance, scope manufacturers are adding functions that support Internet of Things (IoT) designs as well as designing and testing new faster network protocols. To accommodate these requirements, newer oscilloscopes have built-in instrument functions, such as logic or protocol analyzers and digital multimeters. Perhaps nothing illustrates the evolution of oscilloscopes better than the plethora of handheld, portable scopes. When compared to the scopes of yesteryear (giant steel boxes with CRT screens that took up quite a bit of lab bench space), mobile scopes look like small miracles. Handheld, mobile oscilloscopes, such as the Scope Rider from Rohde & Schwarz, weigh 2.4 kg and include more than four hours of battery runtime. They’re available as four-channel or two-channel instruments, the latter with a digital multimeter, with bandwidths of 60, 100, 200, 350 and 500 MHz. Take, for example, the Scope Rider from Rohde & Schwarz (R&S). It combines five instruments in one, features isolated input and communications interfaces, meets CAT IV standards, and can carry out measurements on low-voltage installation sources up to 600 V. Ideal uses include mobile installation and maintenance work. It features an acquisition rate of 50,000 waveforms per second, a 10-bit A/D converter developed by R&S, and a maximum bandwidth of 500 MHz for the analog input channels. The foundation of this portable multiple-test-instrument is a high-performance oscilloscope with a precise digital trigger system, 33 automatic measurement functions, mask test and XY diagram mode. The scope can function as a logic analyzer with eight additional digital channels, as a protocol analyzer with trigger and decoding capability, as a data logger, and as a digital multimeter. The large format capacitive touchscreen lets users operate it as a tablet PC. It also features large buttons for use with gloves and a practical multifunction wheel for parameter adjustment. The R&S Scope Rider’s IP51 certified housing offers protection from environmental hazards such as dust and dripping water and has passed all mechanical load tests in line with military standards. In addition to a microSD card, the instrument features USB and Ethernet ports for easy storage and transfer of measurement data. The integrated WLAN interface can be configured as a hotspot for remote control with a smartphone, tablet PC or laptop. A web browser on the mobile device is all that’s required, with no need for additional software or apps. As for more traditional bench-top oscilloscopes, standard offerings include more bandwidth, faster sampling and capture rates, and the same multi-instrument capabilities in mobile scopes. A typical example of the kind of oscilloscope available today is the MDO4000C series of oscilloscopes from Tektronix, which can be configured with up to six instruments in a single unit, including a full spectrum analyzer. It can also provide a synchronized view of analog and digital waveforms along with RF spectrum traces, making it a useful debug tool for IoT and other embedded engineering applications. 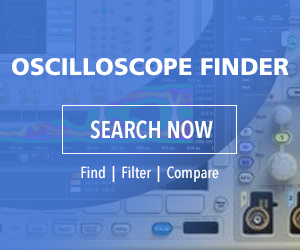 The scope adds onto its core oscilloscope functionality with options to add a spectrum analyzer, arbitrary/function generator, logic analyzer and protocol analyzer. The 6-GHz spectrum analyzer features the ability to synchronize views across time and frequency domains, and the ability to perform vector signal analysis. As for the logic analyzer, its timing resolution is down to 60.6 psec and independent logic thresholds per channel enable capturing of multiple logic families at once. As far as performance specs go, it offers bandwidth from 200 MHz to 1 GHz and can also be upgraded at any time. It also features a 20-Mpoint record length, up to 5 GS on all channels and greater than 340,000 waveforms/sec capture rate. Compared to stand-alone instruments, the MDO4000C saves time lost from having to look for and configure several different instruments. For instance, the built-in arbitrary waveform generator makes it easy to capture signals on the scope, modify them and then replay them through the generator. This could come in handy for something like margin testing by making it easier for users to add noise to any signal. Aside from the oscilloscope itself, software tools and other accessories abound. These serve a number of functions, from adding custom features geared for a specific application, to keeping the scope calibrated properly and thus delivering clean and accurate data. For example, SignalCorrect software from Textronix, combined with the company’s TSC70902 calibration source, which works with the DPO/MSO70000 real-time oscilloscope, simplifies the process of characterizing and de-embedding the effects of cables, fixtures and other interconnects for more accurate and repeatable high-speed signal measurement results. Tools such as SignalCorrect software from Textronix, together with a calibration source, can simplify the process of characterizing and de-embedding the effects of cables, fixtures and other interconnects. Cleaning up signals aides in more accurate and repeatable high-speed signal measurements. Various types of interconnects, such as cables, fixtures, adapters or RF switches, are used to connect the signals on a device under test (DUT) to an oscilloscope. As signal speeds increase, interconnects impact signal characteristics and can lead to distorted eye shapes due to effects such as ISI, parasitics, delay, impedance mismatch, losses and variability. In the past, characterizing and de-embedding interconnects required expert know-how and the use of expensive specialized equipment. But these newer tools let even novice engineers quickly and easily perform these tasks using a standard, high-speed, real-time oscilloscope. SignalCorrect provides step-by-step guidance from initial setup through to measuring insertion loss and creating and applying filters. The software is designed for intuitive operation with a friendly GUI and detailed information that guides the user through the process using both text and graphical content. The software supports creation of multiple filters from a single measurement and enables comparison of raw waveforms with different filter designs. As for the stand-alone TCS70902 calibration source, it uses a compact form factor for placement closer to the interconnect under test (IUT) for more accurate measurements. Two 9-psec fast edge outputs enable dual input measurements and full de-embed of single-ended, differential and common mode signals. This fast rise time lets users characterize at speeds beyond 50 GHz. Another problem exacerbated by modern high-speed signal designs is crosstalk. Increased speeds in data communications systems has led to higher data rates and parallel data lanes, which are placed closer together. The combination of higher bit rates and tightly spaced lines leads to an increased amount of crosstalk. As a result, crosstalk is becoming a more significant problem. Power supplies are also an important component. They can create interference on the data lanes they drive in the form of noise and jitter, and they themselves can be susceptible to data-dependent noise, such as simultaneous switching noise, which leads to ground bounce. One solution to crosstalk comes from Keysight Technologies in the form of their N8833A and N8833B crosstalk analysis applications to assist in the diagnosis of crosstalk. The application detects and quantifies the presence of crosstalk, and it can also determine which aggressor signals are primarily responsible. The application can go one step further by actually removing the crosstalk from the victim waveform so engineers can visually compare the original waveform with the clean waveform side by side. Engineers can also compare the results from other scope analysis tools, such as real-time eye diagrams or jitter analysis, giving them a direct way of quantifying the amount of improvement they can expect by mitigating the different sources of crosstalk. Faster signal speeds combined with tightly packed circuit board signal traces has led to more problems with signal crosstalk. Keysight Technologies’ N8833A and N8833B crosstalk analysis applications help designers diagnose crosstalk issues. The crosstalk analysis application can provide a lot of valuable insight into the design. For instance, it can help engineers determine the margins the design would recover without the crosstalk. It can also help determine if a signal that fails design specification can pass without the crosstalk. This can lead to important design decisions such as whether or not it is worth spending the time and effort to improve the crosstalk effect or where in the design to improve. The crosstalk analysis application can analyze up to four signals (aggressors or victims) at the same time. No additional simulation inputs or files are required. It can handle different types of crosstalk including transmission line near-end crosstalk (NEXT) and far-end crosstalk (FEXT) as well as power supply aggressors, including power supply induced jitter (PSIJ), voltage-dependent amplitude noise, and simultaneous switching network. Some tools are designed for a specific application. For example, Teledyne LeCroy’s new QPHY-HDMI2 and QPHY-eDP expand the company’s automated transmitter test solutions for display standards to include HDMI Version 2.0 and Embedded DisplayPort. Application-specific tools, such as Teledyne LeCroy’s new QPHY HDMI2 and QPHY-eDP, aide designers doing testing of HDMI Version 2.0 and Embedded DisplayPort. The software option for the WaveMaster/SDA/DDA 8 Zi series of oscilloscopes offers a concise set of validation/verification and debug tools written in accordance with version 2.0 of the HDMI electrical test specification. HDMI test modes cover amplitude, timing and jitter parameters. In addition to standard eye pattern and jitter tests for HDMI 2.0, the SDA real-time test equipment platform provides a complete set of amplitude and jitter measurements as defined in the HDMI specification. The QPHY-eDP software option provides an automated test environment for running all of the real-time oscilloscope tests for sources in accordance with Version 1.4a of the Video Electronics Standards Association (VESA) Embedded DisplayPort PHY Compliance Test Guideline. QPHY-eDP supports testing at up to 5.4 Gb/sec for full coverage of all bit rates included in the eDP 1.4 compliance test guideline.